Fathers of the Church: The Early Church Was Catholic! One of the things non-Catholics (and even many Catholics) are surprised to discover is how Catholic the Early Church was. (As in, VERY.) And nothing makes this point better than reading the writings of the Early Church Fathers. Below is a list of resources that will help introduce you to the Fathers. It’s by no means an exhaustive list but, hey, it’s a start. Many of the sources below are free. The Catholic Encyclopedia at New Advent is helpful in these regards. The Catholic Perspective on Paul: Paul and the Origins of Catholic Christianity, by Taylor Marshall, Kindle or paperback. But Aquilina’s book Fathers of the Church is out in its 3rd edition, Kindle or paperback. 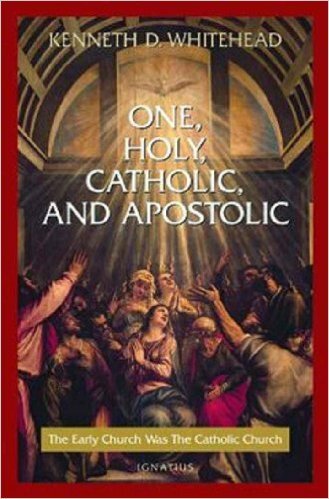 One, Holy, Catholic and Apostolic: The Early Church Was the Catholic Church, by Kenneth Whitehead, Kindle or paperback. The Fathers Know Best, by Jimmy Akin: Kindle or paperback. The three-volume set Faith of the Early Fathers is good too. I’ve got it at home. Have barely made a dent in it so far. See the Logos/Verbum version below. This is not a Catholic site but you can download the writings of the Early Church Fathers for free here and free is good! Translations by Phillip Schaff in the 1800’s, public domain. A quibble: Logos seems to be somewhat ambivalent about Verbum and Catholics at best, though it is getting better, I think. High praise: That said, it blows away every other piece of Scripture study software I’ve ever used, it’s hand-tagged by HUMANS, and it’s got Catholic Tradition in there, too. Hands down, the best, quibbles aside. Catechism of the Catholic Church Collection (9 vols.). By 8 authors, 8 publishers, 1851–2011. See video on product page. In the Catechism of the Catholic Church Collection, thousands of the Catechism’s citations come alive, linking to the original documents. The collection gets you behind the Catechism’s summary of the faith and into the primary sources themselves. It includes the most important texts the Catechism cites, and so lets you see not only what the contemporary Church teaches, but what it bases this teaching on. You can use the Catechism as a type of commentary on the other texts in the collection—for example, you can quickly find every instance of the Catechism’s citing a certain Bible verse or document of Vatican II. The collection includes the Lectionary of the Catholic Church, so the Catechism becomes an automatic companion to the daily readings. With the Catechism of the Catholic Church Collection, the Catechism is transformed from a summary of Catholicism into a gateway to the Catholic faith. Providing a wide array of early church writings translated into English, Faith of the Early Fathers offers excerpts of critical theological developments in the first seven centuries of Christian history. From Clement of Rome and Polycarp to Augustine and Basil, and from Chrysostom to Ambrose and Jerome, these volumes track the formation of Christian doctrine—both the orthodox and the heretical.The passages are keyed to the numerical order established in M. J. Rouët de Journel’s Enchiridion Patristicum. But these volumes are not just a translation of that standard work. William A. Jurgens has investigated and selected the most frequently cited patristic passages, including much that is in Rouët’s volume and much that is not. All passages have been freshly and accurately translated from the best critical editions. Each selection is prefaced with a brief introduction addressing authorship, time and place of composition, and its purpose. Each volume is thoroughly and critically indexed by doctrine, Scripture, and general terms. The Fathers Know Best: Your Essential Guide to the Teachings of the Early Church, by Jimmy Akin. More than 900 quotations from the writings of the Early Church Fathers, as well as from rare and important documents dating back to the dawn of Christian history. The fathers’ teaching on nearly 50 topics, including modern hot-button issues like abortion, homosexuality, and divorce. This groundbreaking work presents the teachings of the early Christians in a way unlike any other book. It flings open the doors of the crucial but little-known age covering the birth of Christianity and the triumphant march of the gospel throughout the ancient world. The rich Christian heritage of East and West comes alive in the volumes of The Fathers of the Church, a series widely praised for its brilliant scholarship and unparalleled historical, literary, and theological significance. The series consists of now 127 published volumes, representing the longest modern run of translated church fathers on the market.Spanning the first five centuries of Christian history, many of these ancient works had never been accessible in English before these publications—and many are still inaccessible outside of these editions. Containing hard-to-find writings from early church fathers such as Cyprian, Jerome, Basil, Ambrose, Peter Chrysologus, and many more, these volumes provide the best scholarship in translation and early church history, making these works not only delightful to read, but unmatched in patristic work.